Last night I tweeted two very frustrating, dare I say fustrating images. The first is my 3 hour trend graph of Happy Dex readings. You see how that nice little trend line is so not doing much out of the sub 80 range. And the current BG is 46. Yeah. Looks great doesn’t it?!?! 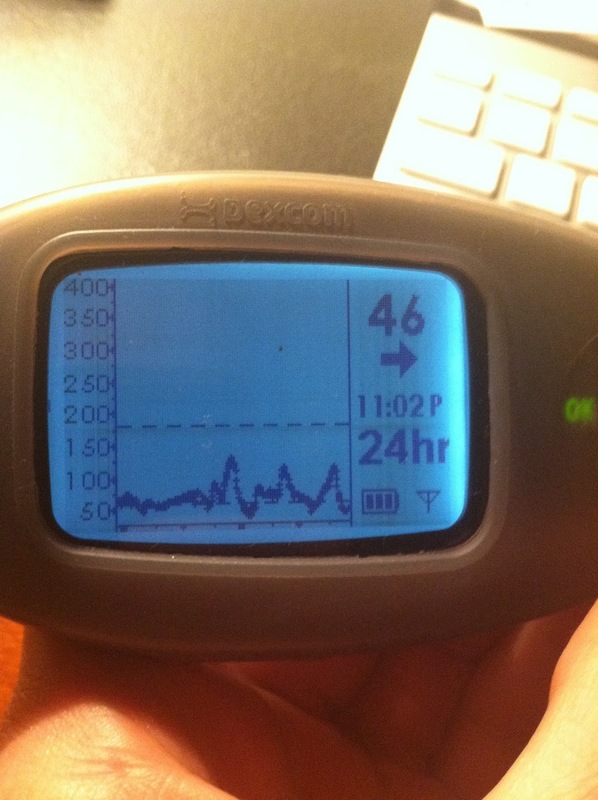 Let’s go to the 24 hour graph. Aside from some major attack spikes of ice cream, handfuls of m&m’s, gorges of meals, I haven’t cleared 155 in the past 24 hours. I mean 155 I don’t want to be there either, but the point is. I don’t want to be at the 46 I was showing last night either. Yet still be able to tweet the images. To text with Jess who awesomely reached out to me, knowing why I am so annoyed about this annoyance. So many innuendo’s about not being about not being able to keep my sugars up…. and such dirty joke wise have gone through my head. But I am not even going to attempt to go there. It is just not how I roll today. 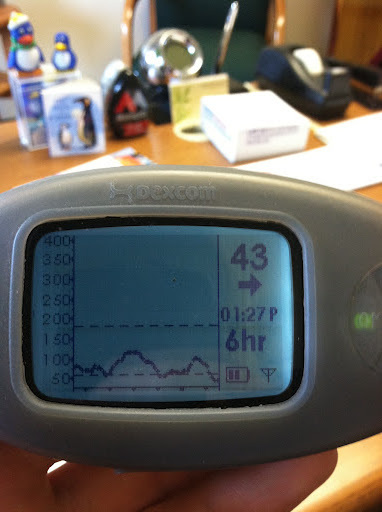 Maybe I hit a sweet spot with my infusion set. I am sure some of it could be end of life for the CGM as well. But I am just getting annoyed. I am cautiously counting to make sure what I am eating and giving myself are what they should be. But doesn’t seem to matter. I barely bolused for lunch today. And here is another fine example of me and my D playing well together. I thought maybe this 43 was a phantom number, so I checked with my desk meter. Nope that gave me a 51. The only thing in this picture that made me smile were all the penguins on my desk. Today I am just very disgruntled. I am so not gruntled. On a die note, even though my spell check is telling me that gruntled is not a word. I don’t think I have ever heard someone use the word gruntled before. It apparently has a definition. Who knew?? I just thought it was fluff, so one can be disgruntled. ANYWAY, sorry about that. Today is just a day to be annoyed I guess. I am happyish. Well not. I feel fine. Sadly. I have eaten stuff to treat the low. 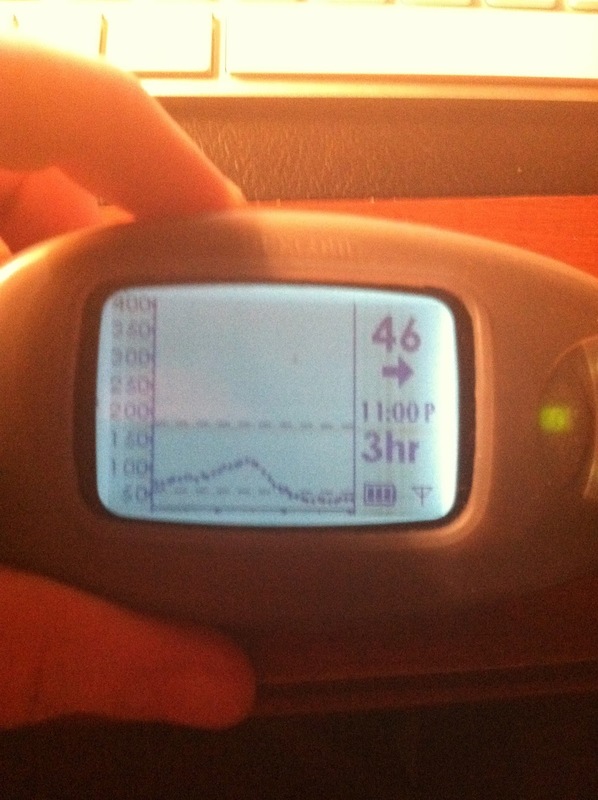 Who knows how long the latest glucose tab attempt will work. I am guessing not long. I will just continue my annoyed, non-gruntled vigilance. Today is a D must Die day. See what I did there?? Haha. At least I can joke if nothing else. Not happily blogging at 51 right now. Gimme a cookie. I am outta here!